619 Greenwich St. N. Y.
T. J. Murphy was Timothy J. Murphy, who was in partnership with Richard Herrmann as Murphy & Herrmann at 99 Thompson St. from 1903 to 1909. Timothy J. Murphy (1880?-1949) died in 1949 when this short notice appeared in the New York Times, 17 December 1949, pg. 17, "Timothy J. Murphy Special to the New York Times, Yonkers, Dec. 16 - Timothy J. Murphy, a retired iron manufacturer who formerly for many years conducted the T. J. Murphy Iron Works at 619 Greenwich Street, Manhattan, and who lived at 263 Riverdale Avenue, Yonkers, died late last night in St. John's Riverside Hospital. His age was 69." Richard Herrmann (1851-?) was recorded in the 1900 U. S. Census, age 49, born April, 1851, in Germany. The census says he immigrated to the U. S. in 1860. He lived at 434 West Broadway with his wife, Lizzie, and their four children. 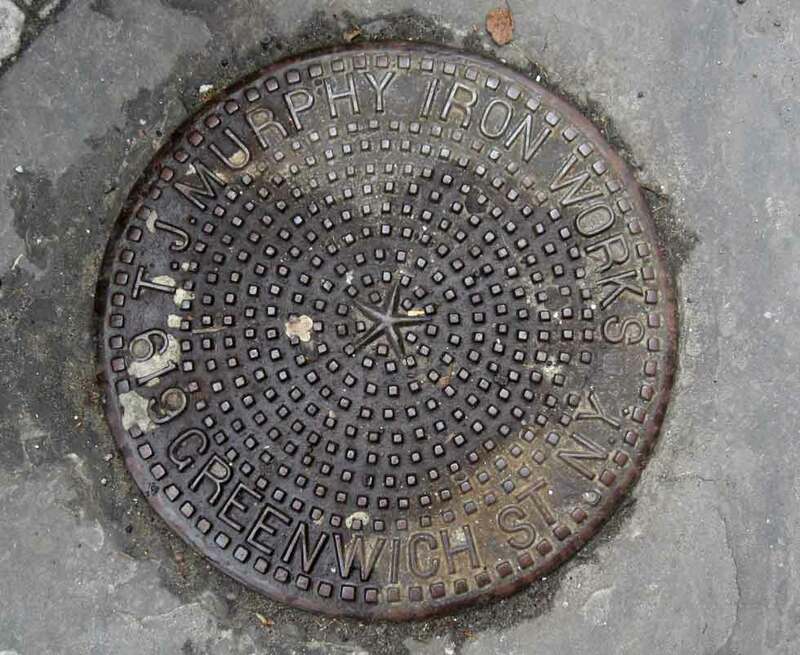 Another T. J. Murphy coal chute cover is found at 138 Howard St. near the southwest corner of Lafayette St.